Cupcakes are perfect for every occasion. They are just plain cute and these dairy free, gluten free Orange Cupcakes are bursting with flavour. Fresh squeezed orange juice and zest are essential in this recipe. To bake amazing cupcakes from scratch you just need to commit to squeezing oranges. If you are not sure it is worth the effort just drink some of that fresh juice. That taste cannot be bottled. But, the recipe works just fine with juice out of a box and you can still add orange zest for that extra punch of flavour. We made gluten free Orange Cupcakes with orange icing at my recent Gluten Free & Dairy Free Baking Class and they were a hit. Of course I tested them, took samples to my colleagues at work, made some for family and friends plus ate my fair share, just to make sure the recipe was perfect. This is the usual sort of commitment I make to recipe testing, all in the name of good blogging practices. There are many kitchen tools to juice citrus fruit; a hand held wooden reamer, the juicer that sits on top of a bowl, plus hand and electric juicers. Your hands are good enough if you are squeezing half a lemon over fish. If you are juicing a bowl of oranges you may want something to make the job easier. The fashionable hand held press juicers come in varying qualities and sizes. Sometimes the colour of citrus fruits like this yellow and green one, they are really the best juicer in the world. If you know someone who regularly juices citrus this is a fabulous gift. A small electric juicer works too, so if you happen to have one like I do, it makes this job a breeze. These cupcakes are made with sorghum flour and potato starch. 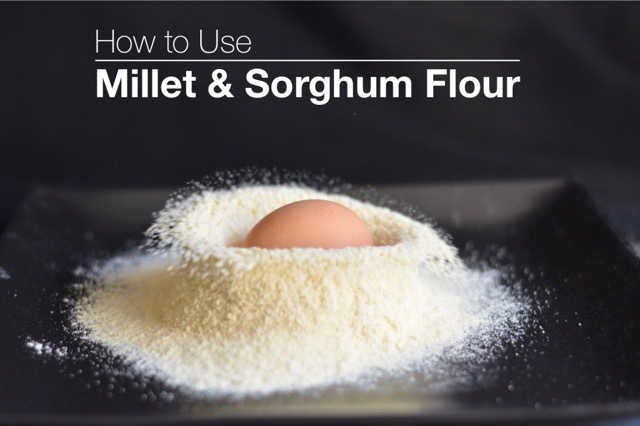 Learn more about this whole grain, high protein flour in this post, How to use millet flour and sorghum flour. It is an excellent choice for baking and I use it in my homemade gluten free flour mix with great results. Dairy free baking is new for me. Since ten to twenty per cent of people with celiac disease have some degree of lactose intolerance it makes sense to learn more about dairy free cooking. Lisa came for a cooking class and inspired my first Gluten Free & Dairy Free Baking Class. These light, airy cupcakes are from that menu. Every kitchen needs tools. Buy the ones you like and expect most of them to last a very long time. You don’t need the most expensive tools but avoid frustration by purchasing good quality items. -colourful paper cupcake liners go with everything so are great to keep on hand. TIP – Put cooked cupcakes into a new cupcake liner to show off the colour. –silicone cupcake liners are the best environmental choice and ideal for everyday muffins and cupcakes. They are available round or square and require a little adjustment with baking times. –portion scoops for both mini and regular size cupcakes ensure a consistent size therefore result in more even baking. -a reusable piping bag set or disposable piping bags (12, 24 or 50) are easy to use but a regular freezer zipper type bag works for icing cupcakes too. -At home you can display cupcakes on any flat tray, a pedestal tray or a fancy cupcake display stand. Many thanks to Karina over at the Gluten Free Goddess for her inspiration. She is a goddess in the kitchen, and if you are not familiar with her website you probably want to check it out. I’d love to hear how your cupcakes turned out in the comments below. Zest 2 orange and set aside. Squeeze oranges to measure 1 cup of juice (plus 3 Tbsp more for the icing) and set aside. Preheat oven to 350°F. Fill cupcake pan with 16-18 paper liners. In mixing bowl whisk together sorghum flour, potato starch, sugar, salt, baking powder, baking soda and xanthan gum until evenly combined. In a large pyrex measuring cup mix orange juice, zest, oil, honey, eggs and vanilla until combine. Add to dry ingredients and stir just until combined. Let the batter sit for 1 minute before scooping into paper-lined cupcake tins. Bake in preheated oven 20-25 minutes. Remove from the oven and let cool slightly. Transfer cupcakes to a wire rack and allow to cool completely before frosting. Makes 16-18. In medium mixing bowl of an electric mixer beat shortening until smooth. Slowly add icing sugar, vanilla and orange juice. Increase speed once all ingredients are combined and beat until desired consistency. Add more juice if icing is too thick and more icing sugar if it is too runny. Spoon icing into a plastic freezer bag or pastry bag with a piping tip. Frost cupcakes piping in a circular motion starting on the outer edge and finishing in the center. Swirl up as you finish.